How Much Does it Cost to Create a Music Streaming App like Spotify and SoundCloud? The music industry holds an international value of $9150 million dollars in 2018. Out of this, Spotify, the Swedish firm, has an evaluation of 26 billion dollars and is active over 72 countries. The app became the sensation that it is today by providing a modern solution to age-old entertainment at affordable rates. In fact, Spotify came as a rescue raft to the sinking music industry that couldn’t get rid of online music piracy. Free subscription: Lets users listen to limited music with ads in between the records. Premium subscription: The plan where the user pays the full amount to stream music. The workflow is self-explanatory and to the point. Spotify delivers music to users of all kinds while teasing them with the luxury of their premium subscriptions. Soundcloud also stands in the row of the world’s leading music streaming website. The website earns a total revenue of about $250 million and it has total online subscribers around 100,000 which have turned to reach its net value of $1 billion. They also have an effective ad running model. Other successful music streaming platforms such as Pandora and Soundcloud have also been observed to follow similar patterns. The music streaming apps that tops the streaming charts, succeeding Spotify are amazon music and iTunes. It is also noted that the top choice of music streamed through these mediums also tend to change indicating the demographic preferences of these apps. Thus, it is clear that music streaming isn’t going out of the scene in the near future, and when apps cater to specific genres, they have proven to be successful. The user penetration of streaming apps is said to increase an average of 2% for every passing year indicating the magnitude in which the customer base is growing for the demand. Music streaming, at present, has thus become a medium of communication than just sticking on to conventional entertainment. The stats are clear. The streaming industry is taking over most of the fields, from education to business podcasts. Storage is a cardinal factor that determines the performance potential of a music streaming platform. Cloud storages such as Amazon S3 bucket equips these native apps and websites with the capacity to store and transcode unlimited amount of data. The security provided in this cloud ensures that your data remains protected from any kind of theft by incorporating encryption models. The adaptive scaling and comprehensive streaming are added icing on the cake. Content Delivery Network also plays a crucial role in setting up the nature of music streaming. An efficient CDN has a large number of local servers to store highly requested data in corresponding geographical locations and deliver them at a faster rate. This process helps in cutting down the buffer time. Dataproc or other cloud platforms has simplified platform infrastructure development & maintenance to a great extent. Before the launch of Platform as a Service (PaaS) or Application Platform as a Service (aPaaS), building a portal that could execute commands in the way they were intended was a humongous challenge faced. This single factor consumed most of the resources in an average small-time development, thus restricting website/app development to large labels. When cloud computing services kicked off, it gave space for aspiring companies with limited resources to create their own websites and apps. Video players allow websites to be compatible cross-browsers, resulting in a finer user experience. Majorly used for building mobile apps and games, this component goes on to prove its efficiency by making striking features a reality. 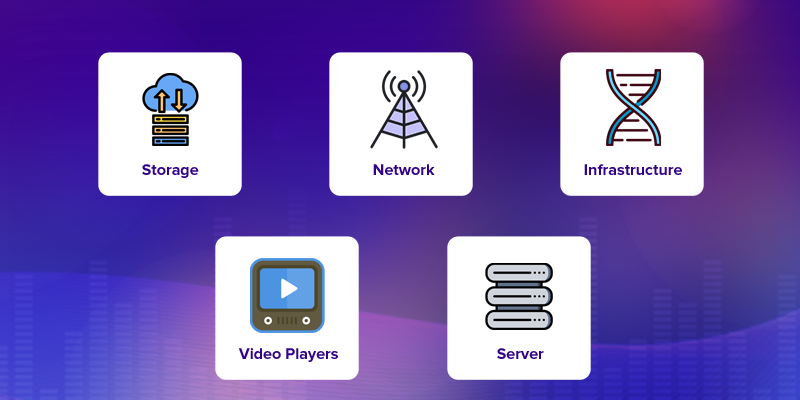 Gea based streaming, backing up audio and video files and enabling offline browsing, video players overall lets web apps to be cost-effective and labor saving. Proxy servers authorizes protocols for transmitting files containing audios and videos or any other sort of multimedia files to and fro via the internet. Through monitoring web traffic and filtering suspicious packets that pose threat to the viability of the websites, they also serve as a content filter. Search algorithms weave music apps as a product of commercial ideal. Algorithms can be used to resist noise and distortion, make them flexible and capable of filtering foreground noises and compress data files. Search algorithms in specific contain multiple patterns to retrieve audios in a fraction of a second. This results in higher user engagement rate and increases in product quality. In the age of connectivity, any platform that doesn’t integrate with its users through social media is bound to meet its doom sooner than later. Social media creates a rich marketing ecosystem that has proven to be highly influential, owing to the valuable data you can receive through these platforms and know their interests in a better manner. It is evident that the above elements form the crux of the music streaming model. When these boxes are ticked with the right devices, there is near to no chance that a streaming solution wouldn’t be a successful model. Having the above requisite elements in mind, Vplayed has created a readymade audio streaming solution with which anyone can create an on-demand, live streaming podcasts or combinative functionalities as per the requirements. Vplayed believes in developing the world’s top music streaming industries like Spotify and Soundcloud with features and functionalities that help to leverage your music streaming website to the global industry. Vplayed follows certain substantial infrastructure in leveraging your music streaming service and embeds monetizing business model to generate profitable revenue. To give an idea of how the solution has been engineered to reap maximum benefits, let’s take a brief look at the technical stack of Vplayed. Vplayed’s prime focus was to be able to provide a solution that could sustain any amount of incoming data. To achieve this, they have used Amazon S3 bucket in order to impart the users with the scope to store and transcode an unlimited amount of data in their app/website. In addition, S3 bucket also secures the data stored in it from all kinds of online treachery. The highly adaptive scaling and streaming come in as an added bonus. HTML5 video player is used in general by Vplayed as they give the developers the option of adding external links and applications to audio files initiating friction to amplify your reach. The HTML5 player is adept to carry quality pictures, sound quality, the ability to be adapted through extensions, and be compatible across all devices cross-platform. The solution also gives the client their choice of freedom, in which they can suggest any other player of their desire to be integrated. Content delivery network is essential to build online streaming platforms as they greatly reduce the usage of bandwidth by data files and cut down transmission costs while increasing the global presence. Vplayed employs Akamai CDN to engine their solution, as the CDN has a proven history of low latency, high scalability, security, and reachability. A memory cache, being self-explanatory, is a system where the memory is stored in local servers and devices in the form of cache. Vplayed has a highly responsive distributed memory object caching system that captures and stores data in a temporary location and transmits it promptly when requested. This increases the response rate and frees the requests of the database. Given a detailed account of the technical stacks that have been cultured in Vplayed to make it a successful strategy, it is evident that the features embedded in this solution are going to be nothing less of marvel. Below are the awe-striking features Vplayed has adorned itself with. The history of the tech world has witnessed the downfall of great tech innovations only to become a hit in a couple years later by another company, but with a better UI/UX value. It was Betamax before VHS, Archie before Google. Though the latter went on to become the norm, these products were a revamped version of the previous ones. Thus, Vplayed understands the essence of an admirable UI/UX and sees to that there is no compromise to the user’s vision. The ability to create personalized playlists is crucial for an affluent music app. Paid playlists, genre-based playlists, algorithmic playlists, branded playlists, Vplayed can withhold any structure with no fuss. Algorithm is the key line to a better user engagement. Searching for your favorite music with bare minimum detailed goes great runs. Social connectivity provides not only a window to understanding your users better, but it also expands the possibilities of word-to-mouth marketing on a larger platform. Vplayed concentrates both on longer user engagement and engagement retention. Push notification captures the attention of app users even when they are not on the app. Offline downloads can be both done for free, or monetized based on the website owners inclination. The option to invite peer groups and form communities has proven to increase engagement on Vplayed’s previous projects. 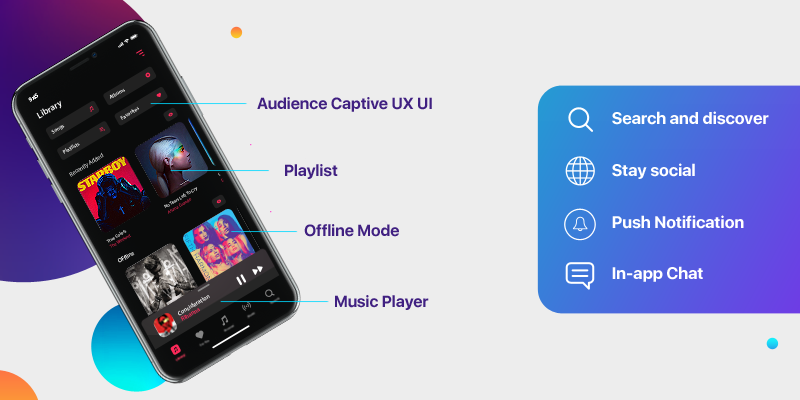 The built-in powerful bass, customization to setting the tone of audio streaming specific playlists, and ability to stream on all devices are enabled by the video player. What can be better than an interactive music streaming session? Give the most to your users and reap the best of both worlds. Vplayed has always put themselves in the shoes of the app builders to design the necessities of the solution. This includes the elaborate 6 step monetization scheme that aims to offer a music streaming solution that stimulates monetization returns for its users. Let’s look at the three most utilized features of them all. 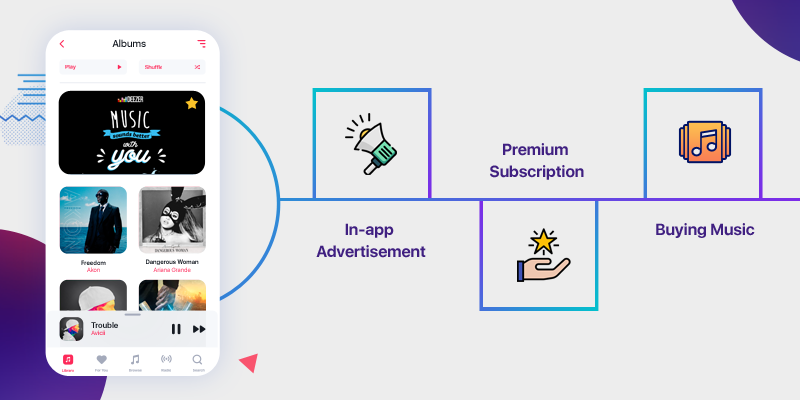 Built with an eye for app development, in-app ads and purchases have gone to become the starrer of monetization model than the paid app framework. Customize in-app ads to your creative convenience with Vplayed. Premium subscription model is the next major yield producing monetization model. What you choose to entertain your premium account holders with, and how do you entice your other customers to subscribe to your premium content is entirely at your will as Vplayed is customizable from any front. Buying music to get stored at their local memory, or within your app has demonstrated high profits when it comes to music streaming. Storage and hosting decide the entire skeleton of the magnitude of the app you intend to build. It is self-explanatory that the more vibrant features added, the higher the cost of building it is going to be. What may seem to be the same result from using a primitive technology from a superlative front, will affect the usability of the app. Using high-end technology stack to build your website is worth every last penny as it directly reflects on the response time, loading time and user-friendliness. Custom animation, design, and UI UX elements are the face value of the app. It is as important as the technologies used to run the app. There are many options by which you can outsource the work to build your app. Hiring a well-versed team of developers and cash out a readily available solution have depicted high value. Owning a music streaming app is a parallel ride is both amusing and jitter-inducing. So is choosing how to build your app and to fixate on your budget Vplayed looks after all the factors to bestow its customers with the best end products. Our 40+ successfully running global projects stand testimony for it.